This year’s Tyneside 114 expedition to the Mull had a simple aim; to seek out new dive sites off the South West tip of the island. Whilst most dive trips to this area of Scotland tend to focus on the wrecks in the Sound of Mull, the waters surrounding the island itself also appear to offer a lot of potential for exciting diving for those willing to make the extra effort to explore its jagged coastline. Some of these sites however lie out in the open water offshore around amongst the exposed waters off the Torren rocks, with the possibility of underwater drop-offs and steep pinnacles that rise dramatically up from deep water. There are also a number of ships that over the centuries have been lost in these waters, vessels such as the SS Nyland and the SS Cathcartpark. This area therefore has huge potential in terms of offering exciting and adventurous diving. There is however no established dive operations in this area and apart from the odd local scallop diver and the occasional passing liveaboard boat, the area appear to be rarely visited by sports divers. The southwest tip of Mull itself is remote, rather bleak, but also has a special haunting beauty. This area despite its relative remoteness is also very popular with visiting ‘pilgrims’ because of the nearby Island of Iona with its origins of being the early centre of Celtic Christianity. With some of these thoughts in mind, planning for the Mull expedition by Tyneside 114 started in earnest in late 2007. Inevitably any expedition to the more remote parts of the UK requires participants to be in possession of the relevant skills and experience to deal with any potential difficulties that might arise. An essential element of the preparation for this trip therefore included an audit of the skills and qualifications of potential participants, with a view to organising relevant training to ensure that expedition members had the qualifications and the breath of experience required to complete the expedition aims. Fortunately the BSAC offers a range of training relevant to the demands of the expedition and this became the focus of branch training in the months running up to the expedition. 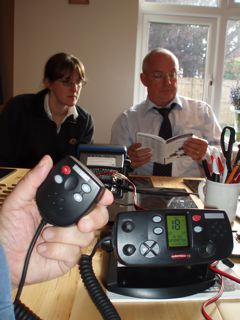 Club members completed a range of training including boat handling, 02 administration and the RYA GMDSS VHF short-range licence operator’s course as well as the recently introduced Wreck Appreciation course. 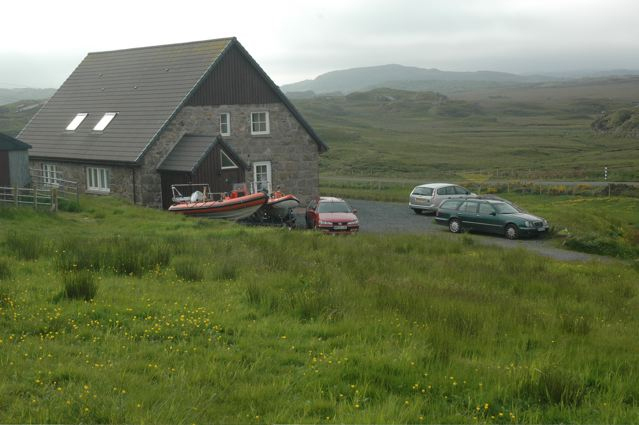 From research on the Internet two rental cottages were located not far from the village of Fionffort . These cottages also had the advantage of offering lots of outside space for the secure storage of both RIBs as well as offering sufficient remoteness to allow the operation of compressors without antagonising neighbours. 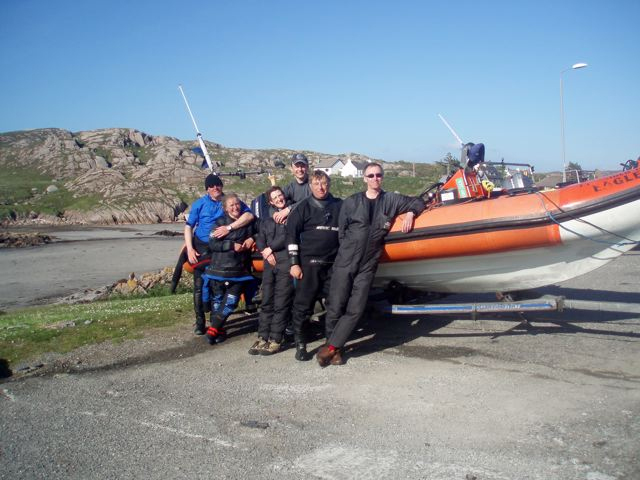 Tyneside branch has over recent years mounted a number of successful expeditions to other remote areas of the UK, so the decision was made to also try our luck and apply for a BSAC BEGS grant. 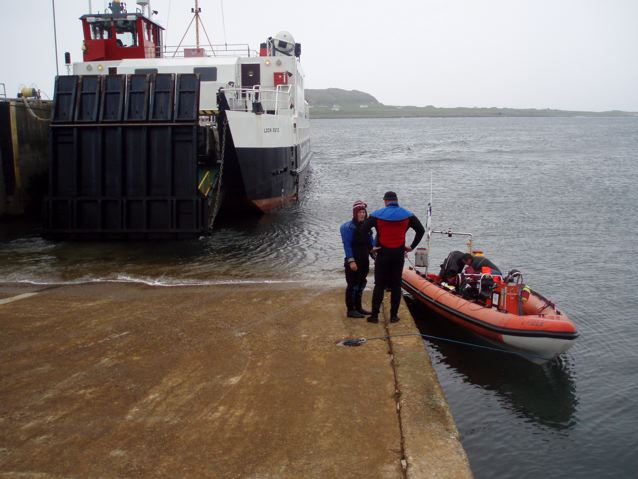 The aim of the BEGS scheme is to promote and encourage BSAC members to develop their skills and experience through the planning and participation in safe but challenging expeditionary environments. To promote this aim the BSAC offer a total of 5 expedition grants per year of up to a £1000 each to its membership. This application process involves submitting a detailed expedition plan, including a financial budget and cost breakdown, details and qualifications of all the participants, as well as a risk assessment that covers the planned diving programme and expedition aims. To be eligible, an expedition has to be based in ‘home waters’; In other words, in our case it would not have helped fund a club expedition abroad to the Red sea for example. The actual process of completing the BEGS application form requires a considerable amount of careful thought. In reality however any planned expedition to some of the more remote locations off the beaten track should always require careful planning. The possibility of obtaining such a lucrative grant can act as a powerful incentive to ensure that a thorough expedition plan document is completed and submitted as part of the BEGS application process. In Tyneside 114 case, the application proved successful with a grant of £1000 being awarded towards the funding of the expedition. 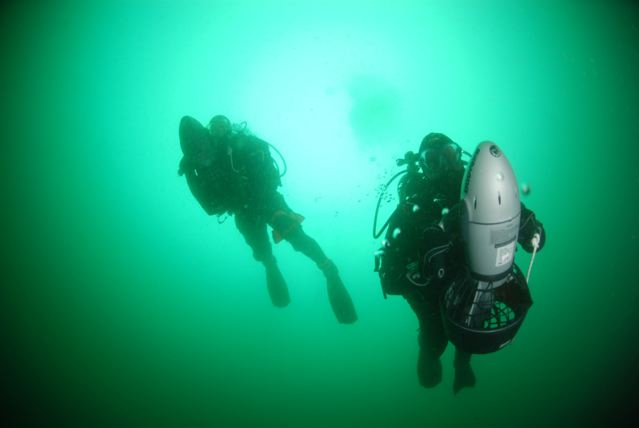 Some of this grant was used to buy equipment, in particular the purchase of two underwater scooters, with the aim of greatly increasing the range of the underwater area that could be searched and explored on the expedition. The remainder of the grant was used to subsidise some of the identified training needs of the expedition participants. The grant itself was paid in two parts, the first £500 a few weeks before the expedition took place, with the remainder of the grant being received following receipt of a completed expedition diary/report. In the immediate run up to the expedition taking place however, it became increasingly evident that the weather was not going to be kind to us, with brisk South easterly winds being forecast for the majority of the week. Fortunately, the expedition organiser when considering this area’s potential dive sites had considered this possibility. Islands have the advantage of offering some form of shoreline that is protected from the prevailing wind and swell. 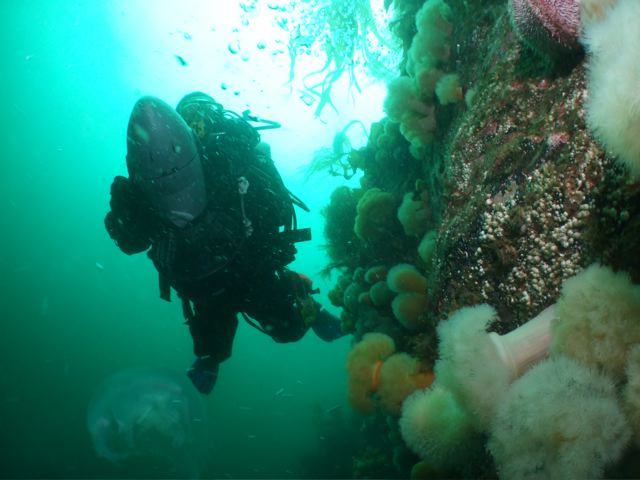 In our case, whilst dive plan A looked in jeopardy, this area of Mull also has the benefit of offering a range of other more sheltered dive sites which again appear to have had little documented diving exposure. In anticipation of poor weather the expedition organiser had wisely identified a range of potential other dive sites from the chart. Plan B was about to be put to the test. 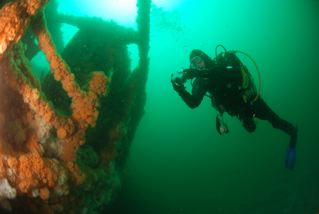 The first days diving of the expedition focused on the wreck site of the SS Ostende. This 2718 ton steamship was built at Swan Hunter’s, Wallsend and launched in September 1903. She appears to have had a relatively uneventful seagoing career until the night of the 16/17th of January 1943, when whilst on passage from New York to Liverpool with a cargo of war supplies which included munitions, she suffered a mystery explosion in the area of her bow and started taking on water. The Ostende was swiftly diverted to the more sheltered waters of Loch na Lathaich near the village of Bunessan to await salvage and repair. On the night of the 20th January however fire broke out resulting in a devastating detonation of some of her cargo of ammunition resulting in the destruction of the Ostende and the drifter Lydia Long that was tied alongside her. Two members of the Ostende’s 48 crew died in the ensuring inferno. Indeed many of the buildings surrounding the Loch were apparently damaged by the sheer force of the huge explosions that resulted from the fire igniting some of the munitions cargo. Wreckage from the Ostende was even flung high onto the surrounding hills and can still be found littering the surrounding hills overlooking the bay. 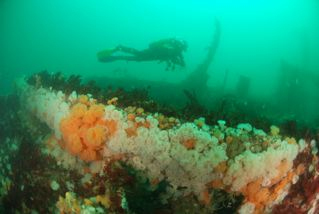 Over the years this wreck site has been extensively salvaged to the point that today little remains of this once proud vessel. There is however still evidence of some of her war cargo with numerous brass ammunition cases still scattered across the seabed. 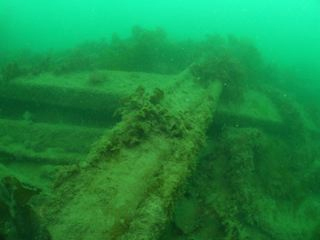 The wreck itself lays in only 8 metres of water. 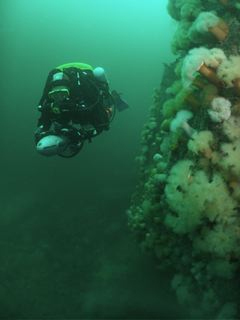 The main aim of diving this particular wreck site however was to complete a sea search survey of the surrounding seabed around the main area of wreckage. In this regard this dive proved to be a fruitful one with numerous sightings and recordings of various species of nudibranchs and flatworms, as well as a rich variety of various species of crustaceans including hermit crabs and numerous long legged spider crabs, some fabulously decorated with weed. We also came across colonies of delicate white seapens as well as numerous scallops. Whilst the Ostende perhaps does not provide the most exciting of wreck dives, she did provide an excellent ‘critter dive’. This site was again selected from the chart on the basis of its potential with little real prior indication of what to expect. The pinnacle itself rises up from 30 metres to within 4 or 5m of the surface, with the uppermost area of the reef covered in kelp. Dropping down the sides of the pinnacle soon revealed a steep rocky slope, notable for numerous colonies of bright yellow sponges. This site whilst providing an excellent scenic dive had the added bonus of some sandy gully’s being located at the base of the reef with a healthy population of scallops, which clearly had benefitted from the protection provided by the rocks from dredgers. From the local chart this site does not at first appear to have much to offer in terms of dive potential. Indeed it was a combination of the poor weather and rumours of a lost fishing trawler which had apparently collided with this exposed reef that resulted in us venturing down to explore this remote site. Whilst we found no signs of wreckage from the lost trawler, our efforts were rewarded by a dive on a beautiful wall that dropped down to a boulder slope in 25 metres of water. The wall itself was covered in a rich mantel of plumrose anemones. Further down, at the base of the underwater cliff, we also came across numerous sea cucumbers hidden amongst the boulders, their delicate tentacles straining to catch plankton in the gentle current. This site also provided an interesting encounter with a large dogfish, as well as having an abundance of shoaling pelagic fish patrolling across the top of the reef. This site provided an unexpected but beautiful scenic dive with plenty of marine life in evidence. From careful study of local marine charts, a number of potentially exciting looking sites were initially identified. Inevitably part of the fun of expedition diving is you never quite know what to expect when it actually comes to diving these sites; Often these dive sites turned out to be rather mediocre, but sometimes you can be very pleasantly surprised. On this particular site, the contours on the chart appeared to indicate the possibility of an exciting wall dive. 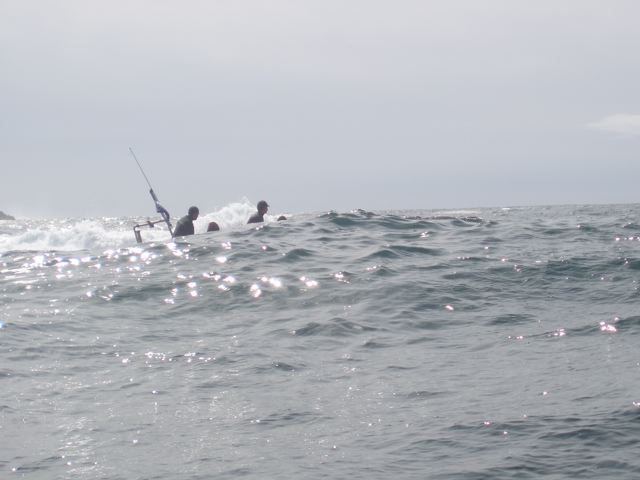 The shot was dropped in shallow water and with some anticipation we headed out across the shallow kelp, out towards the promise of open green water. Suddenly the kelp line abruptly ended, and we were confronted with a rocky underwater Cliff that plunged down into the dark depths. Looking over the edge one was confronted by a steep cliff that quickly consumed by the dark depths. Dropping down over the edge we were quickly enveloped in dark but clear water. The wall itself proved surprisingly bare of life apart from a few scattered colonies of dead men’s fingers and some peacock worms that were located under an overhang, their feathery arms extending out into the gentle tide. Nevertheless this site offered quite a dramatic and atmospheric dive. Almost inevitably essential equipment will break down despite ensuring that all vital equipment is serviced prior to the start of the expedition. Being prepared for such problems again highlights the need for good planning prior to the trip taking place, with a view to identifying appropriate sources of assistance to ensure that the expedition can continue should the worst happen. In our case one of the portable compressors broke down. Fortunately we had the contact details of a marine engineer based at Tobermory who might be able to assist with repairing the compressor. 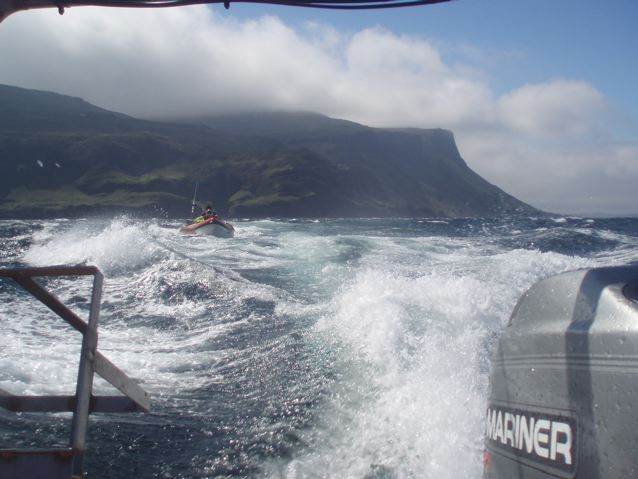 The decision was therefore taken to take both RIBs to Tobermory to dive in the Sound of Mull dropping the compressor off en-route. Visitors to Mull are often surprised by the sheer size of the island. When planning journeys across the island plenty of time must be allowed, as the majority of roads are single track with passing places en-route. After two and a half hours of stop start travelling, with one serious puncture to contend with, both boats eventually arrived safely in Tobermory, necessitating a speedy launch into the harbour to catch slack water on the wreck of the Hispania. From here it is a relatively short journey around Calve Island and down the Sound of Mull to the wreck site of the Hispanic. Our efforts however were rewarded by a superb dive with excellent visibility on the wreck of 15 metres plus. This dive simply highlighted why the Sound of Mull remains such a population popular destination for UK diver. That evening we returned back to the South West coast of Mull and continued to explore a number of other promising marks and sites. Inevitably some of these dives proved somewhat disappointing. GPS marks originating from a local lobster fisherman for a wreck off Soay Island revealed nothing but kelp and rocks. That however is half the fun of expedition diving, as amongst some of the more mundane dives there always lays the tantalising possibility of finding that unique untouched wall dive or wreck, where others have not been to before. In our case, despite the best efforts of the weather to disrupt the expedition, we nevertheless did succeed in finding some ‘new’ worthwhile dive sites. In addition, we also completed a number of marine life research Seasearch observation forms, adding just a little more knowledge and data about the marine ecology of this remote area of the United Kingdom. 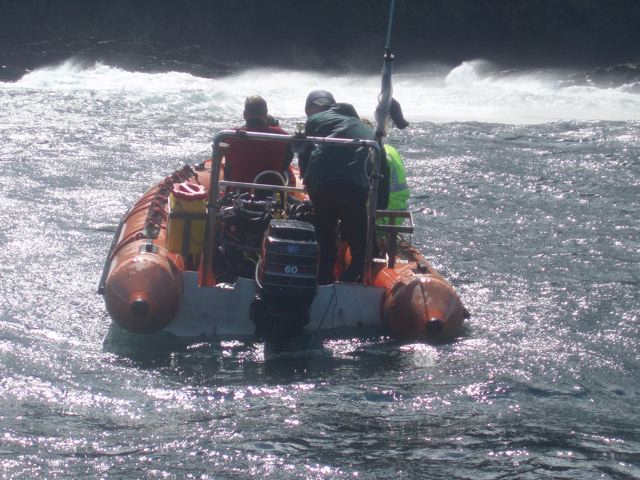 All participants however inevitably benefitted from the actual experience of taking part in this expedition, both in terms of undertaking the training in the build up to the trip taking place, as well as from the actual hands on experience gained from all the boat handling, compressor filling, dive planning, and problem resolution that are involved in any expedition process. Above all else however, the expedition itself proved to be a lot of fun as well as a great opportunity to develop the participants diving skills and experience. Slipway Ffionphort, permission being obtained from the Calmac pier master. Care has to be taken to avoid causing disruption to the busy Iona ferry shuttle that uses this slipway. The BSAC offers a total of 5 expedition grants of £1000 each year. The aim of the scheme is to promote adventurous diving.